Quad bikes are four wheeled all terrain with handlebars supporting the controls and a saddle, and look similar to a motorcycle. 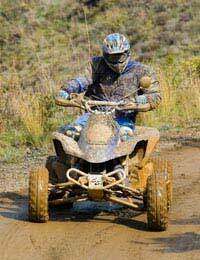 Because you have driven a motorcycle or car don't assume you will be able to ride a quad bike. They handle completely differently from a car or motorbike and can overturn easily. Their response can be sudden and if not controlled properly especially going uphill or downhill, you can find yourself underneath the bike very easily. Turning and cornering techniques also need to be mastered before you take the bike off road as there are special precautions that need to be taken before completing these manoeuvres. Quad biking and off road biking can be great fun, but quad bikes are powerful machines and must be handled with proper care and attention. So to get the maximum pleasure there are some things to remember. Always wear proper protective clothing. Helmet, gloves, eye protection, and appropriate footwear, preferably boots. If you have waterproof trousers it's a good idea to wear these as well as it can get a bit muddy. Sports users should wear body armour. Always wear a crash helmet. There is no law to say you must wear a helmet, but not doing so would mean taking an unwarranted risk, as your helmet is the only protection you have against serious head injury should you come off your bike. Insure your vehicle using a specialist insurer. Quad bikes are not designed to carry passengers. Carrying passengers can easily unbalance the machine making it difficult to control. Quad bikes are not made to be driven on the road. They don't conform to regulations regarding, tyres, horns, lights, speedometer etc and so it is illegal to drive them on the road or pavement. They do not handle properly on tarmac roads and cornering can be extremely difficult. However, many quads are now road legal with PLG classification - the same as a car or motorcycle. Quads are usually only allowed to be driven on private land and you must always get permission from the landowners before driving your bike. It is illegal to ride in parks. The maximum weight for anyone wanting to ride a quad bike is between 18-20 stone. The minimum age for quad biking is eighteen. Although you do not need to hold a driving license to quad bike. Juniors under the age of eighteen can ride bikes under proper instruction, with written parental consent. Do not put children in control or travel as passengers on these vehicles, even on private land. There are some small bikes and mini quads but even these can be too powerful for a child to control. Young children don't have the strength or the reaction speed to handle motorised vehicles-so keep them off- it is dangerous! Drive at an appropriate speed for the conditions. Most fun days organised by companies who offer quad biking are fully controlled, using only qualified quad bike instructors. They will run through a safety briefing and will make sure you are adequately supervised throughout the day. If you are an individual who owns or drives a quad bike for fun or as part of your job, then you should have proper tuition from a qualified instructor, or from an experienced rider, before driving a quad bike.